Here at Avanceon, we’ve been developing solutions for our customers for a long time. And in the process, we’ve run into – and solved – many “interesting” technical challenges. We’ll share some of the more generally applicable ones on this page: after all, if we already have a solution, why should you have to develop your own? Installing MSSQL Server with Wonderware software requires an understanding of how Wonderware bundles the server and what the licensing issues are. Wonderware System Platform 2014 R2 is bundled with MSSQL Server 2012 SP1. However, this bundling only comes with the physical Wonderware media (there is a separate SQL disc in the box). If you download Wonderware Software from the WDN website, you will not get SQL Server along with it, as Wonderware is not authorized to distribute SQL via the website. The SQL Server 2012 SP1 copy included with the Wonderware physical media is licensed by an OEM agreement that Wonderware has with Microsoft. Because it is an OEM license it does not come with a physical Microsoft license certificate; however, the product key on the SQL Server CD is the same for all bundled SQL Server discs included in any box certificate license. Therefore, if you need to install SQL Server on a machine for use with Wonderware, you can do so using any physical SQL Server installation CD included with the Wonderware Software. Note that standalone MES, Workflow or Wonderware Enterprise Integrator (i.e. w/o System Platform) are no longer covered by Wonderware’s OEM agreement with Microsoft, A separate SQL license is required. You must install MSSQL before you install any Wonderware components. If you do not install SQL Server 2012 SP1 (or another version) first, you will be prompted by the Wonderware software to install SQL Express. However, if you are using MES, Workflow or WEI with System Platform you can use the OEM disc to install the required SQL and be licensed. Editing Wonderware Historian Client *.aaTrend Files, The EASY WAY! A WonderWare Historian Client trend file (*.aaTrend) points to a Historian Server that no longer exists. Do not recreate the *.aaTrend file in question. Edit it the file with an XML editor (do not use Microsoft Word); execute a batch find and replace command substituting the address of the new server for the address of the old one. 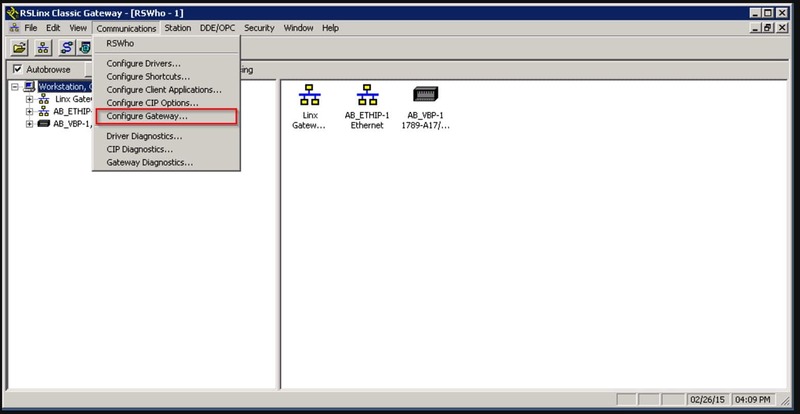 VMWare does not recognize a USB device on a local machine. To begin with, make sure you are using a newer copy of VMWare Workstation. You must be running version 7 at minimum, but version 9 is preferable. If the VMWare software level is acceptable, check to ensure that the host Windows system recognizes your USB device and that it works when you plug it in. If the local machine does not recognize the USB device or does not work properly there, the problem may reside on the hardware or driver level, and it is less likely the device will work on the virtual machine. a. Right-click (My) Computer icon, and click Manage. c. Check the list for your USB device. If the USB device appears with a yellow question mark or an exclamation mark, you may not be using the correct driver. d. To update the driver, right-click on the device and click Update Driver. 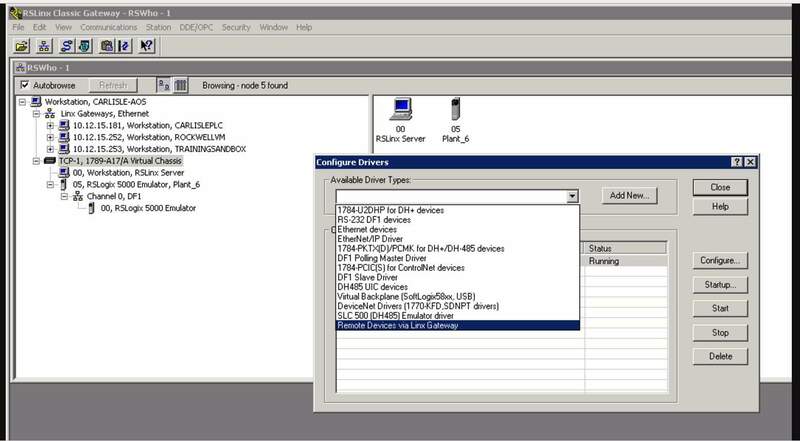 If the Device is a USB-to-serial convertor, Windows will list it under “Ports. ” If the device isn’t working, follow the same procedure as above for deleting and reinstalling it. Finally, make sure the appropriate drivers are installed on the VM as well as on the host. If they are out of date or incompatible, the device won’t function. After you’ve set up the IP address of an Allen-Bradley 1756-EN2TR EtherNet/IP communication bridge module using its USB interface, you may be unable to ping the device even though the front display shows the device on the network with the proper address. Set the switches on the side of the module to 8-8-8 and perform a factory reset. After the reset is complete, set them back to the default 9-9-9 setting. Improving performance of a development environment when using Rockwell Studio 5000 Emulator and a separate computer for development. When developing and testing a large system in a virtual environment, performance can be improved by running the emulator on a separate VM from the programming software. Performance improvement is sometimes complicated by a lack of Ethernet support in the emulator environment when configured in RSLinx as a virtual bus. In this case, we needed to use RSLinx on the same virtual machine (VM) that hosted a WonderWare application server and its OPC client. This would also apply to using RSLinx on a separate computer to bring various hardware related industrial protocols that could be used in a virtualized environment into RSLinx, but that had no access to that hardware. For example, DH+ using PCMK cards. This is accomplished by using RSLinx configured as a gateway between two PCs / VMs. 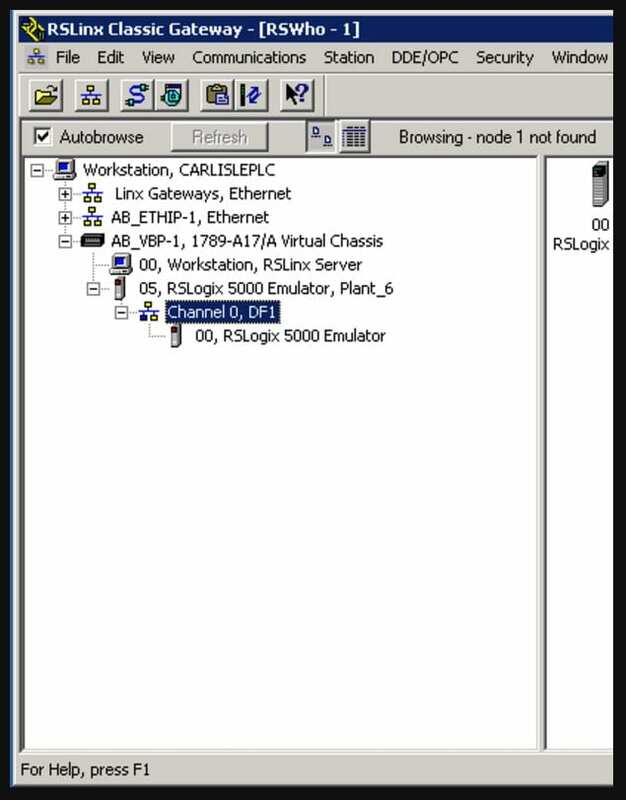 Use RSLinx as a Gateway between two computers to avoid developing on the computer running the PLC emulator. It is critical to update RSLinx to a current version due to EDS file incompatibilities between the emulators and RSLinx. 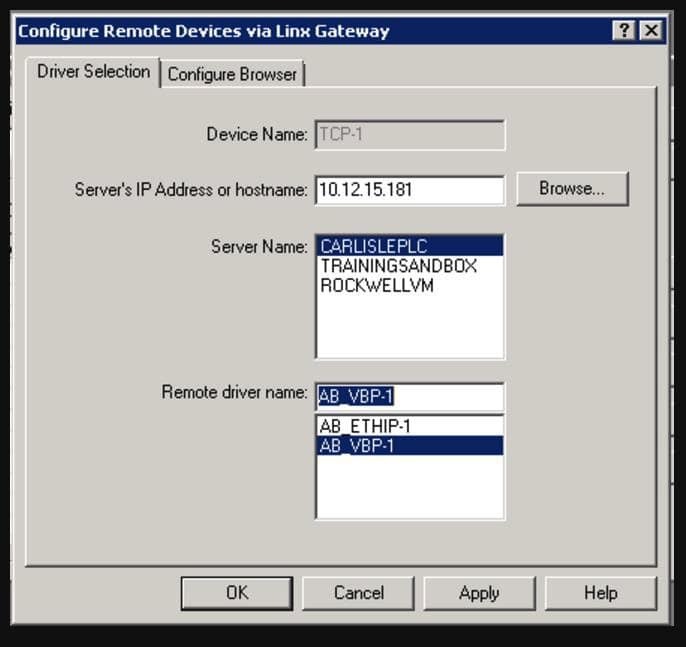 From the RSLinx Classic Gateway menus choose: Communications/Configure Gateway as in Figure 1, below. 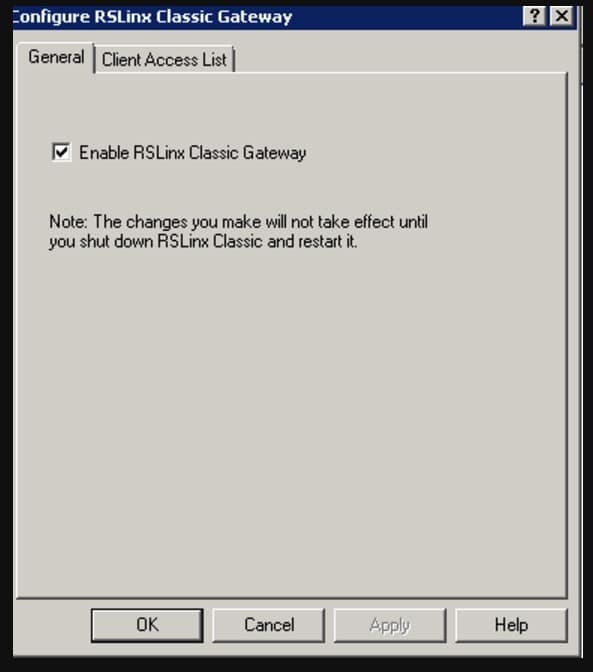 Restart RSLinx after configuring it to act as a gateway (don’t just close it), as in Figure 2. You should have already installed the Virtual Backplane adapter for the emulator, as represented in Figure 3. If not, look at the help in the emulator for configuring RSLinx. You should be able to browse for the first PC and see it by computer name. The configured driver should appear in the remote driver name, as in Figure 5. If your controller appears with a question mark indicating an unrecognized device, make sure to update RSLinx. Turning off the Windows Firewall under Symantec Endpoint Protection. Sometimes, various network tools (I’m looking at you, BootP) do not work well with the Firewall on your PC, so you need to temporarily disable it. When using Symantec Endpoint Protection, it manages the Windows Firewall (See Figure 1). This means you can’t turn the firewall on/off via Windows. Disabling Symantec does not allow you to turn the firewall off, and, unfortunately, there is no way to see this. Boot the computer in Safe Mode; this does disable Symantec and allows you to turn off the firewall via the Windows Control Panel. Restart the computer normally and the Rockwell BootP utility will work properly. Restart again to turn the Firewall back on, as Symantec prevents you from doing it via Windows. While attempting to control the speed of a PowerFlex 20P (DC drive) using a 20- Comm-E card, you may discover a scaling issue between the speed reference command you are sending to the drive and the speed command the drive itself is receiving. This is a known issue for PowerFlex 20P drives using 20-Comm-E cards. The 20-Comm-E card still uses counts (-32767 to 32768), relative to the configured min/max RPM or Hz. We saw that while sending a speed reference to the 20-Comm-E card, a different commanded speed was being received by the drive. This becomes apparent when you look at the diagnostics on the 20-Comm-E card using the HIM on the drive; the counts sent to the drive were being scaled between the 20-Comm-E card and the drive. To correct this, calculate the scaling error and use that to scale down the counts sent to the 20-Comm-E card. This in turn scales down the speed of drive to the desired result. In the field, we verified the result using a handheld tachometer. You will also have to invert the scaling error and apply it to the speed feedback. This will ensure that the command/feedback engineering values are in sync. Note: you can adjust the scaling using a parameter in the 20-Comm-E card, but it will only scale the speed command; it won’t scale the feedback. It makes more sense to handle this in the PLC and document it well. Avanceon is happy to offer these suggestions for resolving common issues. Note that since every installation is different, they may not address or be appropriate for your particular situation. We know they’ve worked for us – but use them at your own risk.